A marriage book for today’s couples! In Generation NeXt Marriage, Tricia talks about our marriage role models, our struggles, and what we’re doing right as a generation. The book also offers creative ways to hold our marriages together. Do you still find yourself humming the love songs of the 80s and 90s? Do you still believe that every marriage should be between soul mates? But…do you wonder how you can succeed at love and marriage when the generation you grew up in didn’t? Marriage isn’t what it used to be–it can be better than ever. If you are part of a generation of adults who don’t want to bow to their culture or live and love like their parents did . . . this book is for you. 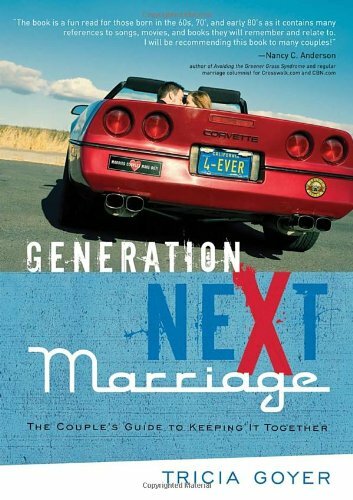 Read Endorsements for Generation NeXt Marriage!